Thirty years ago (1978), Swoop Bags' founder, Sarah Kirk's grandmother gave her brother a handmade toy bag for his heaping pile of Legos. Years later, when her own son got knee-deep into Legos (2011), her mom remembered that bag and made a similar one for her boys (read the entire story on their BLOG). Friends would come over to their house and say, “WOW! Where did you get that bag? What a fantastic idea to help contain the crazy Lego mess!” Right then the idea of Swoop Bags was born. Launched in 2011, SWOOP BAGS – are a re-imagined, modern version of the original toy bag to Sarah's grandmother made. As a graphic designer who loves and breathes modern design and a busy mother of two Lego-loving kids, she sought out to create a bag that was modern in style, simple to use, and very well made. Quality and using the best fabric and materials has always been her #1 priority. They wanted to design a product that would lasts a life time and be past down through generations. Swoop Bags are designed to make cleanup time a breeze! Every Swoop has a 6" edge piece to help contain small toys. The large bags function as a toy storage solution as well as a playmat and toy mat. 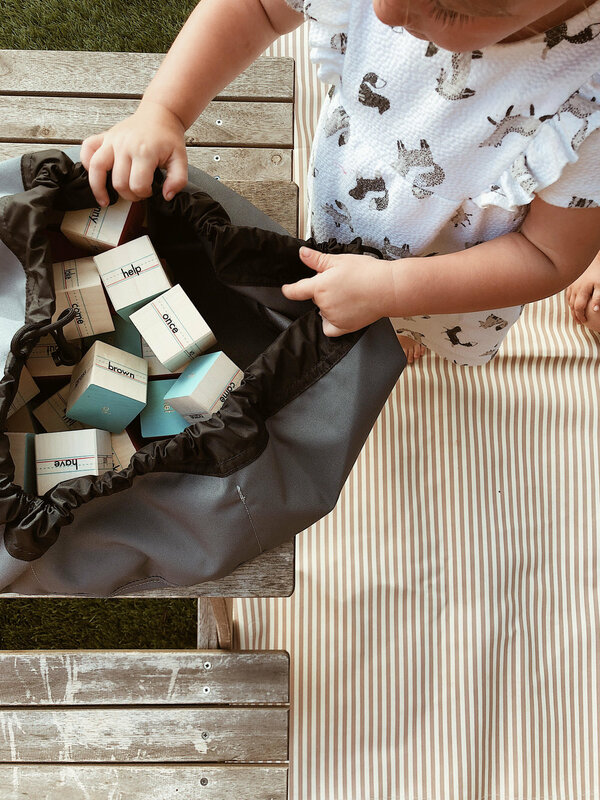 The Original Bags are made from 100% cotton canvas and the Super Bags and Mini Bags are made from durable, tough, water-resistant fabric that is guaranteed for life. Swoop Mini Bags are our portable, travel-size bag – ideal for toys, art supplies, makeup, snacks & lunches and collections of all sorts. Who said you couldn’t take your favorite Lego pieces to the beach or on a long car ride? Swoop Bags come in bold, bright, fun colors and are stylish enough to stash in any room of the house. All products are proudly made right in Seattle - USA. “Just SWOOP it up!” And head over to our Instagram account to enter to win an Original Swoop Bag AND a Swoop Mini Bag!